At our house when we do a shower we go all out and for my cousin Shay there was no exception. Momma Kim is so cute always trying to make everything perfect. When she told me the colors for the shower were bright pink and black, I was excited but had no clue what to do. I wanted to do something classy and different. I love red velvet cake so I just decided to add pink dye instead of red and to use a black cupcake liner, and obviously a white frosting because white matches with everything. This is what I came up with and I thought it was pretty good. In a large bowl, cream the butter, sugar and food coloring until light and fluffy. Add eggs, one at a time, beating well after each addition. Beat in vanilla. In a separate bowl, combine the flour, baking powder, baking soda and salt; add to creamed mixture alternately with buttermilk, beating well after each addition. Fill paper-lined muffin cups two-thirds full. Bake at 350° for 23-27 minutes. Meanwhile, crisco the sides of a medium bowl and put in the white chips. Melt in the microwave in 30 second intervals stirring between each time. When you stir the chips will melt away keep stirring until there are no chunks. It usually takes me about 3 times in the microwave. Make sure that you don’t over cook the chocolate or it’s not as smooth in the frosting. In your stand mixer add your melted chocolate, mix in softened butter, slowly add whipping cream. Then add powdered sugar to desired consistency. Beat on high speed for 2-3 minutes or until soft peaks form and frosting is light and fluffy. Frost cupcakes. Hi! girls! 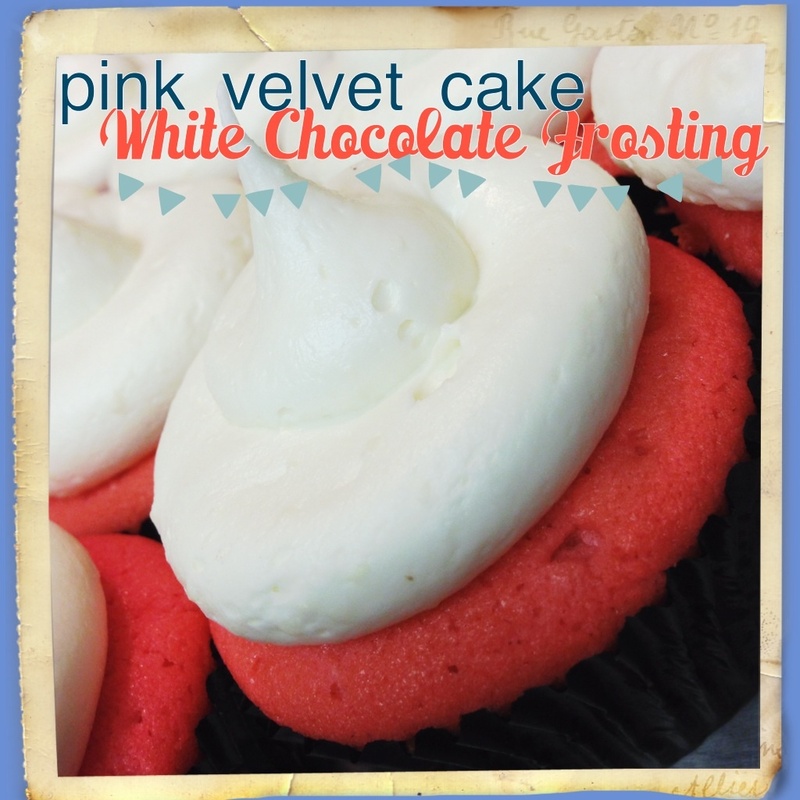 I just wanted to let you know that I’m featuring your Pink Velvet Cupcakes on my blog today! Yum! These look delicious! I like the pink color instead of the red – so cute and girly! Cute! Thanks for sharing & co- hosting Whatever Wednesday at Thank You Honey! Have a fabulous weekend! Hope to see you next week! My son can't resist white chocolate. Even on pink cupcakes! He's picked your pink velvet cupcakes to feature at tonight's See Ya in the Gumbo. Thanks for linking!